Now more than ever, business executives and board members need to have a clear and informed view of risks that have the potential to upend strategy. Smart organizations understand the urgent need for sound risk management on a global scale, and board members realize the need to be involved in risk identification, assessment, and monitoring. 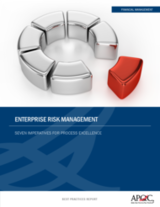 For a company not to be caught off guard (and individual officers and directors potentially held liable or tarred as incompetent) if a major risk were to materialize, companies need to understand what must be done to establish, develop, and refine enterprise risk management (ERM) processes. This report describes effective ERM program leadership and process excellence and focuses on transforming an organization’s approach from a compliance-driven mindset to one that supports strategy execution—an approach that plays offense as well as defense. View the best practices infographic.